The True Story of Mary Cook, Part I: Wagon Trains, Gold Rushes, Shipwrecks, Wars, Fires, Earthquakes, Love & More! Editor’s Introduction: Here is a story that will interest all kinds of readers. This is a tale brimming with drama, history, and incredible events. And for family historians, this narrative is a vivid reminder that our ancestors’ lives were filled with stories just waiting to be discovered – though perhaps not all as astonishing as this one. Intrigued, we invited Casey to tell our readers his aunt’s story, which you are about to read. (Casey is an accomplished writer. If you enjoy this story, check out his website: Write Me Something Beautiful.) Such a long and eventful life as Mary’s requires a bit of story-telling, and so we are presenting the tale of Mary Sawyers Swan Cook in three parts over the next three days. Enjoy! Photo: Mary Elizabeth Sawyers Swan Cook. Credit: from the author’s website, and used with his permission. 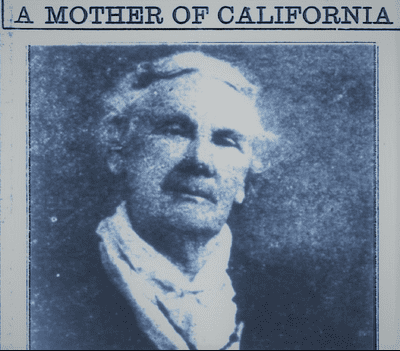 This is the very true story of my 3rd Great Aunt, Mary Elizabeth Sawyers Swan Cook (1839-1924), regarded as one of the early pioneers and “mothers” of California. As professed in a 1923 Willits News article, her story is packed full of romance, adventure, danger, history, courage, love, tragedy, strength and fortitude. Mrs. Cook was caught in the web of an uncanny number of infamous events and persons that define who Californians and Americans truly are. Her story will be passed down to my grandchildren, themselves 6th generation Californians, and the generations to come. “Immigration into California, in the early 1850’s, after the first flush and fever of the gold rush had abated, may not have quite the air of romance of the tradition of courage and of adventure that is our great heritage. These after all were the real creators of the commonwealth; the forerunners of an abiding prosperity; they were state builders. “Mrs. Mary Elizabeth Sawyers Cook lived in Willits for nearly a half century. She is regarded as one of the pioneers of the Little Lake valley. Yet her experience of California life goes back over a score of years preceding. Back of that is the experience of her girlhood in Missouri. Her story is interesting. Her story begins 180 years ago. Mary Sawyers was born in 1839 in Missouri and was the youngest of seven children of Thomas Hiram Sawyers and Mary Pierce “Polly” King. Her father was a farmer and furniture maker. Tom learned the cabinet-making trade in Louisville, Kentucky, and farmed land he bought along the Bullskin Creek in Shelby County. Mary’s 2nd great grandfather, James Sawyers, was born in Tyrone, Ireland, and emigrated to the Virginia Colony about 1745. Mary’s grandfather, John Sawyers, was born in Virginia in 1764. He was a 2nd Lieutenant with the Continental Troops in the American Revolutionary War, and served with the Adams Regiment of the Ohio Militia during the War of 1812, also against the British. 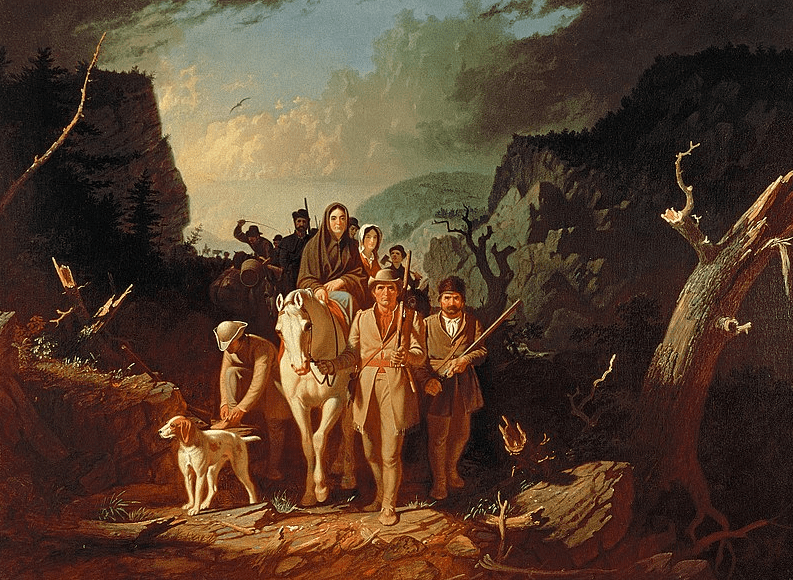 Illustration: “Daniel Boone Escorting Settlers through the Cumberland Gap” by George Caleb Bingham, 1851–52. Credit: Washington University in St. Louis, Mildred Lane Kemper Art Museum; Wikimedia Commons. In 1839, the United States was vastly different from what it is today. It had only been 63 years since the Declaration of Independence was signed. There were only 26 states with a total population of a little over 17 million people. Missouri was the Far West of the young country. Everything beyond was unclaimed or disputed territories. All of California and the rest of the Southwest (Arizona, Nevada, New Mexico, and much of Texas) was owned and controlled by Mexico. This wild, unsettled frontier was occupied by Native Americans and a handful of settlers. Before the Gold Rush in 1849, what is now California was home to no more than 8,000 non-Native Americans. Within three years, over 300,000 newcomers would invade the new state to strike it rich or make money from those trying. Here was the big news at the time in Missouri: In 1838 the Governor threatened to kill any Mormons that didn’t voluntarily evacuate the state. This was followed by the Great Squirrel Invasion of 1839. Hundreds of thousands of famished rodents decimated the farmers’ crops that year, and then mysteriously vanished. Mary’s older sister, Melcena (b.1827), and three older brothers were born in Kentucky: Edward (1829), John (1831) and Fielding (1833). Fielding died a year after he was born, and that same year Tom moved the family 500 miles west to Clark County, Missouri. Their son, Mountjoy King, was born in 1835 and a younger sister died in childbirth in 1837. Mary Elizabeth Sawyers arrived two years later. “My uncle was not married so he took me to my grandfather’s [Edward King] farm in Kentucky to live. All went well for some time, until I began to think of my dear loving mother, and the dear ones that I had left – maybe to see them no more. “Grandfather and all the family were good and kind to me, humoring me to most everything. My longing to see the dear ones I had left finally died away and I could go to bed and sleep without crying myself to sleep. “In a year or so grandfather sold his farm in Shelby County, Kentucky, and bought a farm in Trimble County near the Ohio River – about opposite the City of Madison on the Indiana side of the Ohio River, and I liked it much better. There I could hear the steamboats whistle and I learned nearly all the names of the different steamboats – Ben Franklin, George Washington and many others. So, time passed on and I was growing taller and of course growing older. “The uncle that brought me home with him got married and took me to live with him – to be company for his wife when he was gone. She was a kind and loving aunt and I loved her as such. “When she married my uncle, her father gave her three negroes – one woman and two boys – for it was in the time of slavery – so I stayed with uncle and aunt about one year. “Grandfather missed me so much and thought he could not do without me – and it was so arranged that I went to live with grandfather and I was glad of it, but it was not long until the sad news came in a letter that my dear mother was dead. It was 1842. That mother I was hoping to meet again in this world. No one knows what I suffered but Him who knoweth all things. In 1849, England, Ireland and the United States were hit hard by the virulent cholera epidemic. The virus that attacks the intestines and produces high fevers claimed the lives of Mary’s older brothers, Edward (then 20) and John (18), in March of that year. The young men died within ten days of each other. This clearly was a difficult time in Mountjoy’s life and it doesn’t take much to imagine how hard those years had to be for young Mary Sawyers. Mountjoy was sent away when she was a toddler, so she really didn’t even know him. Her mother died when she was only three years old and her father struggled, as evidenced by his failed attempts to flee to South America. When Mary was eight, her older sister, Melcena, got married and, although living close by, was out of the house and starting her own family. With the deaths of her two brothers, ten-year-old Mary was the only child living alone with her father in a house consumed with grief and shouldering the chores that were previously shared with her three older siblings. But not for long. A year after the death of his boys, Tom, 51, married Margaret “Peggy” Hay, 26 years his junior. Peggy was only two years older than Melcena. Marshall Ney, the first of their seven children together, was born nine months later. Adding to her other duties, Mary helped her step-mother with the care and feeding of her half-brothers and sisters. Soon, another fever would take hold of her father, brother-in-law and hundreds of thousands of other Americans and forever change the course of Mary’s life. 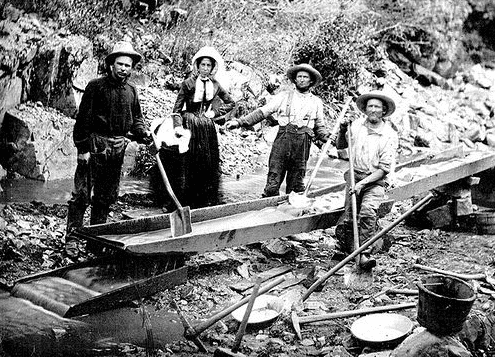 Photo: a woman with three men panning for gold during the California Gold Rush, 9 July 1850. Credit: Wikimedia Commons. 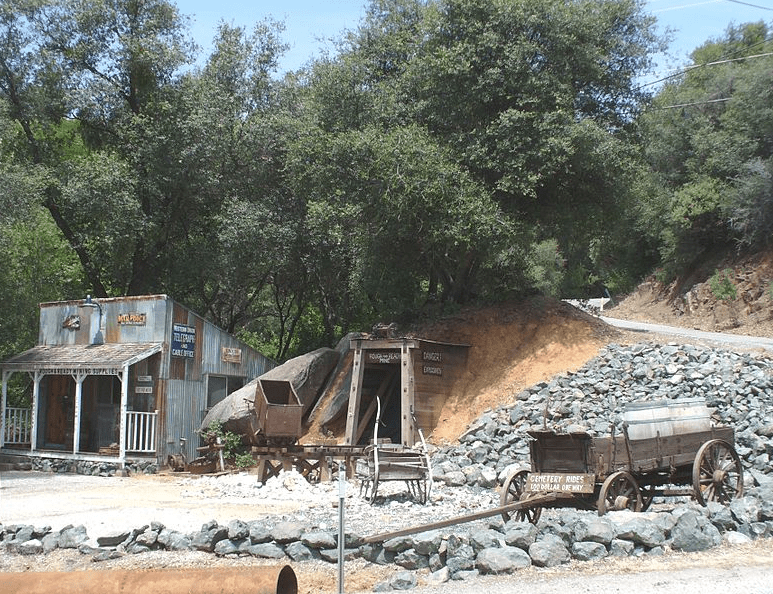 The California Gold Rush began on 24 January 1848, when the precious yellow metal was found by James Marshall at Sutter’s Mill in what is now the town of Coloma, about 30 miles east of Sacramento. By the end of 1849, the lure of gold had brought 300,000 people to California from all over the United States and abroad. The sudden influx of gold into the money supply reinvigorated the American economy, and the explosive population increase hurtled California to becoming the 31st state in 1850. In the fall of 1853, Tom sold his farm, cabinet shop and pretty much everything else he owned. He, like so many others, had contracted Gold Fever and could not pass up the chance of striking it rich. Tom spent the next several months getting ready for the four-month trip from Missouri to California. He bought wagons, oxen teams and the food, supplies and equipment they would need. Although late in the game, Tom was confident they would have luck in the gold fields. The wagon train treks have been romanticized in books, movies and television shows. Suffice it to say, they were terribly difficult and often deadly. In 1854 there was no cross-country railroad, telegraph or mail service. There were no roads; only trails carved into sand, rock and dirt by the hooves and metal-covered wheels of the heavy oxen and wagons. This truly was the “Wild West” inhabited by tribes of Native Americans who were very angry with the invasion of their lands. Their wagon train was led by a man named William Musgrove, a veteran of several crossings. He led the Sawyers-Case party along the well-traveled Overland Trail from Clark County, Missouri, through Council Bluffs (Iowa), along the Platte River (Nebraska), through Wyoming and on to the great Salt Lake (Utah), where they spent two weeks to rest the stock. From Salt Lake the wagon train crossed the brutal deserts of what is now northern Nevada until they reached the base of the eastern slopes of the Sierra Nevada where the Truckee River pours out of the mountains. That place is now Reno, Nevada. They followed the river up the mountains as they made the treacherous climb of the 7,000-foot range to the north side of Lake Tahoe. From there they dropped down the western slope to Pleasant Valley, California, very close to where the first gold was found at Sutter’s Mill. The journey covered about 2,000 miles. The wagon trains had to make it over the Sierras by late September, or early October at the latest. Otherwise, they ran the risk of getting stuck in the heavy mountain snows. Such was the fate six years earlier of the infamous Donner Party. They tried to make it across in November of 1846, but were trapped by a huge blizzard just north of Lake Tahoe in what is now known as Donner Pass. As food supplies dwindled, some men in the party were dispatched to get help. None arrived until mid-February. Of the 89 members of the party, only 48 reached California, many of them having eaten their dead to survive. 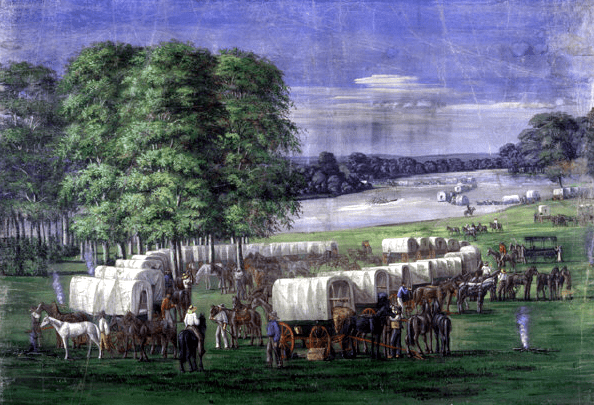 Illustration: “Pioneers Crossing the Plains of Nebraska” by C.C.A. Christensen, 19th century. Credit: Brigham Young University Museum of Art; Wikimedia Commons. “On the third day of May 1854 we left our Missouri home and started to cross the plains for California. After crossing the Missouri River, we were then in the Pawnee Indian country and after traveling three days, the third night the Indians stole 11 head of our best work oxen and killed them and carried the meat across the Platte River – as it happened the oxen stolen belonged to Musgrove, the boss of the train, who had plenty of good work oxen to rig up other teams. “We then traveled on and crossed the North Fork of the Platte River in what is now Nebraska. On the third day of June, about 3 o’clock in the morning, the Indians stampeded our cattle and run them down the river about six miles. The Indians then surrounded us and kept up a continual fire with their flint lock muskets, until about 10 o’clock in the morning. We formed a ring with our wagons and we stayed inside the ring for the Indians were on all sides of us. We were completely surrounded. We could only see the flash of their flint lock guns. We fortified ourselves as best we could until daylight, then the Indians would lay flat on the ground and shoot, then hold up a blanket that looked just like an Indian for us to shoot at. We soon caught on to their trick and we would shoot close to the ground. Then they soon quit and went off to the river. As other trains were coming that were behind us, we sent a man on the fastest horse we had and got help from other trains. We got all of our cattle back. “We heard a few days after our fight with the Indians, that they told some traders that they lost nine of their men. Only two of our company were slightly wounded, one being my older sister, Melcena, shot in the shoulder. The bullet went straight through and lodged in the side of a wagon. Her husband, Jim Case, dug out the bullet and kept it. “We got all straightened out and travelled only about three miles that day, then camped and made ready for another battle, but it commenced to rain with thunder and lightning and kept it up most all night. That ended our trouble with the Indians. We were not bothered with them any more while crossing the plains. “In crossing the desert, which was sixty miles without grass or water, we traveled mostly in the night, until we came to the Hot Boiling Springs. (6) There we met Will Musgrove, the son of the boss of our train. He had brought plenty of cold water which made us all glad. We rested there all day and part of the night. About 10 o’clock in the night we started across a six-mile desert of deep sand and about daylight we came to the Truckee River, a beautiful clear stream of water. There we rested for a while then started across the Sierra Mountains, and made it over all right, and arrived in a little valley called Pleasant Valley, Nevada County, the 3rd day of September, after a long four months of travel across the plains. Photo: Rough and Ready, California. Credit: Isaac Crumm; Wikimedia Commons. From Placerville, the Sawyers and Cases traveled an additional 50 miles north and settled in a mining camp by the name of the Rough and Ready near today’s Grass Valley. The men went to work digging for gold, along with thousands of others frantically seeking the one lucky strike which would bring an end to a lifetime of hard work. The first winter was bitter cold and claimed the lives of many in the camp. The Sawyers-Cases lived in tents, densely packed in this boom town, until wood structures could be built. Fires frequently raged through the camp taking many homes and buildings with them, only to be quickly rebuilt to sustain the quest for riches. At Rough and Ready, Mary Sawyers unexpectedly ran into a young miner, Samuel P. Swan, whom she had known in Missouri. They were married in October 1855. (9) She was 16 and Sam was 23. Mary gave birth to their daughter, Martha Elizabeth Samuel “Lizzie,” in November of that same year. (10) Sam had luck with his mining. He continued to work his claims until the summer of 1857. By that time, Sam had collected enough gold dust to warrant a trip back east to see his family in Pittsburgh. Mary was eight months pregnant with Lizzie when she married Samuel. This likely did not sit well with Mary’s father, Tom, and could explain why Mary, Sam and baby Lizzie stayed on at Rough and Ready and did not follow Mary’s parents and older sister to Petaluma. On the other hand, unlike Mary’s brother, brother-in-law and father, Samuel had amassed a small fortune in gold, and they had the means to pursue their independence. Three of Tom’s and Peggy’s children were born in Willits including their last, Robert Lee, born in 1865, four months shy of Tom’s 66th birthday. Tomorrow: Part II. Mary’s harrowing rescue from the sinking SS Central America. (1) The Willits News, The Sawyers Family, February 12, 1975. (2) Rev. Mountjoy King Sawyers, An Outline of My Life, April 1915. (3) Page 23 of a history of Thomas Sawyers, date and author unknown. A hogshead was a very large wooden barrel used to transport tobacco. (4) Rev. Mountjoy King Sawyers, An Outline of My Life, April 1915. (5) The Willits News, The Sawyers Family, February 12, 1975. (6) This area is now known as Steamboat Hot Springs, just south of Reno. (7) Rev. Mountjoy King Sawyers, An Outline of My Life, April 1915. (8) The Willits News, A Mother of California, May 4, 1923. (9) Thomas Carnegie Burnett, The Family of Mary Elizabeth Sawyers (Swan) (Cook), part of the collection of the Mendocino County Historical Society in Ukiah, CA. (10) Headstone of the grave of Martha Elizabeth Swan in the Washington Cemetery, Washington County, PA.
(11) The Willits News, The Sawyers Family, February 12, 1975. (12) Rev. Mountjoy King Sawyers, An Outline of My Life, April 1915. The 1907 Expatriation Act: Did Your Female Ancestor Lose Her American Citizenship? Oh, I so enjoyed your family stories. I love U.S. history and genealogy, and these stories had both. Looking forward to part 2! Thanks for your kind words, Rebecca — and your enthusiasm! Oh my God! This is my family also! My great grandfather was Sheriff in El Dorado City! My father was born in Santa Rosa, Ca. Fountain Cook also lived in Santa Rosa. Fountain Cook was my great grandfather’s brother. I have pictures of the grave of Mary Elizabeth Cook in Petaluma I believe. Thanks for writing us. I alerted Casey to your comment, and I bet we’ll be hearing back from him. I’d love to see this in book form. These old eyes can read a book much better. So far it is interesting. There’s a town in Tyrone called Mount Joy. It is in Cappagh Parish. My people came from there. Mary’s 2nd great grandfather, James Sawyers, and his family were from Tyrone, Ireland, and then he immigrated to Virginia. This must explain the choice of the, otherwise unusual, name for Mary’s older brother: Mountjoy King Sawyers. Thank you Monta Lee for reading and weighing in on this.